Volkswagen Caravelle 2.0TDI. This minibus has 8 passenger seats, equipped with a powerful engine and reliable brakes. Perfect for convenient transfers during various events. Low fuel consumption, respectable design and the brand reliability distinguish this car from other representatives its class. 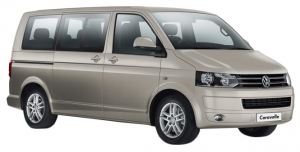 In case you are planning to transfer honorable guests – then rent VW-Caravelle-2.0-D.